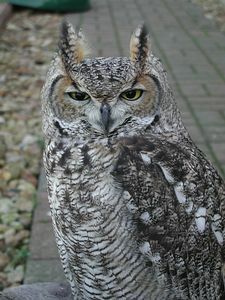 The Raptor Foundation is a bird of prey sanctuary and hospital. It is a unique and exciting place for children and adults alike to meet and learn about owls, falcons, hawks and buzzards in a 30 acre site. There are over 300 raptors and more than 25 species, many of which are threatened or endangered. Weather permitting, we have Flying Displays each day at 12 noon, 2pm & 4pm (during winter light does not allow for the 4pm display). We are now also holding regular twilight flying displays. Full details are on our web site. Check our web site for latest events going on. Twilight flying evenings on April 16/17, June and August to include a light supper or bbq. We can also cater for Birthday parties minumum number 15. Provide visitors an opportunity to meet and learn about birds of prey. Exit the A14 at St Ives and follow the ring road to the industrial estate, take B1040 to Somersham and follow brown tourist signs, 2 miles on left. From A1 exit at Huntingdon, follow signs to St Ives, then B1040 to Somersham, follow brown tourist signs, 2 miles on left.